After the success of our March date we have decided to add another! 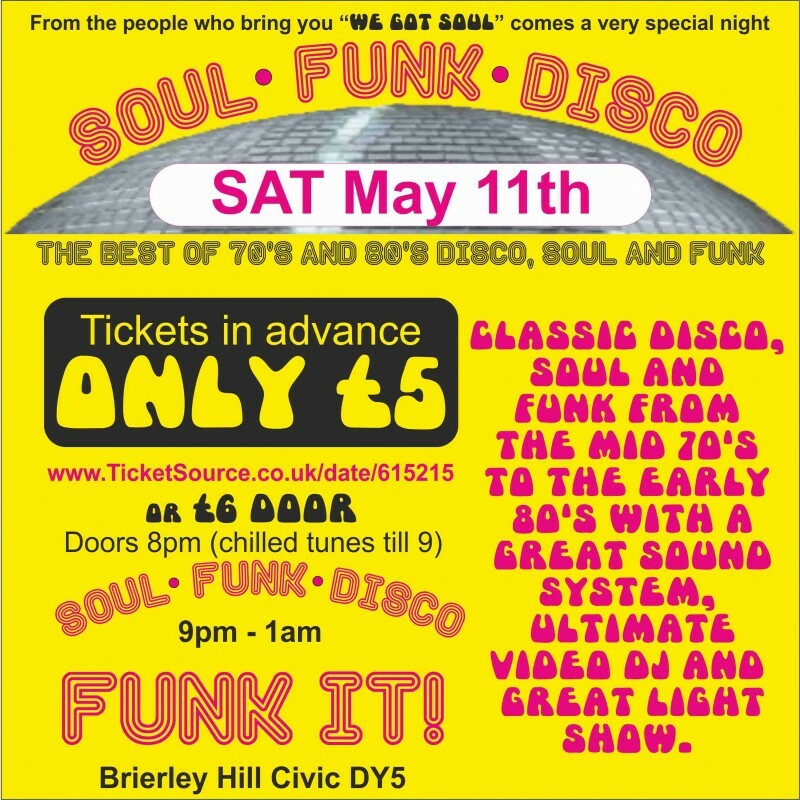 A complete night of Soul, Funk and Disco on Saturday May 11th. We've been running "We Got Soul" now for the last few years and it has built into a truly great night and we cover Motown, Old Soul and a bit of Northern Soul, but we seem to get loads of requests that head into that ... shall we call it ... soulful disco? Its not "Old Soul" and it's not "Stayin' Alive! ", it's that grey area populated by Heaven Must Be Missing An Angel, Rock Your Baby, Love Really Hurts Without You, Ain't Nobody etc. Great tunes, great dancing and they are soulful but we don't really bring them in much on a "We Got Soul" event ...so ...Think “Car Wash”, “C.O.N.T.A.C.T.”, “Miss Grace”, “Young Hearts”, “Rock Your Baby”, “Never Too Much”, “Ain’t Nobody”, “Boogie Nights” , “Street Life” and you’ll get the vibe. Quite simply a great night out and tickets only £5 in advance!